I've talked before about my love of mornings. Mornings are my time. It's the time I'm most productive and they're my special times for doing whatever the heck I want. Now full disclosure here, I am a total morning person, so I can't guarantee my tips will work for everybody. 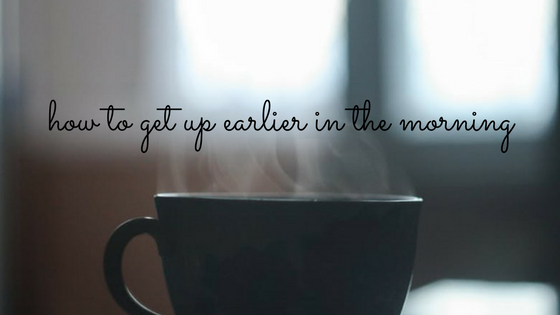 But if you're okay with mornings and just want to be able to get up a little bit earlier, these tips might help. I don't get up ridiculously early, I have to admit. For some people my start of the day probably isn't even early! But I get up about an hour earlier than I need to, which I think counts as "early" in context. I've switched up my morning routines lately to do more in the mornings and I've found that's been a huge boost to my happiness, so a lot of these tips are actually things I've only tried lately, but they have really been working for me. This may sound like a no brainer, but a lot of people don't seem to consider that if they go to bed at the same time as usual but want to get up an hour earlier every day, they're going to feel it. We all need different amounts of sleep to get by successfully - some people can survive on 5 or 6, others need a solid 8-9. So if you're going to get up earlier, you need to start going to bed earlier too. This might mean a few tweaks to your evening routine. If I'm at home, I try to put my phone away at 9pm and spend the last hour or so of the evening relaxing with a book or watching TV with Phil, and I try to make sure I'm heading for bed by 10pm at the latest. That might sound early, but as I wake up most days between 5.30am and 6am, that gets me the 7.5 hours of sleep I need to not be a grumpy witch. I swear by SleepCycle. I admit, I don't understand the science behind it, but I really notice when I don't use it. SleepCycle is alarm app, but it wakes you up at the lightest point in your sleep cycle so you don't feel as tired, within a half an hour window. So for example, if my alarm is set for 6am, it will go off at some point between 5.30am and 6am, depending on when I'm at the lightest point in my cycle. So some mornings I get half an hour of free, unexpected time! I also love SleepCycle because it tracks how long you are asleep, the quality of your sleep and you can see a graph of your evening's sleep. I really like that you can look at your stats over time, and see your average number of hours sleep. This is perfect for determining the best time to go to bed for your morning alarm. The only challenge is making sure you don't want that bonus free time you get, or snoozing through it! Okay I'm trying to get better at this, because I have been totally guilty of setting my alarm 15 minutes early just so I can catch up on my phone, but I've started trying to get rid of that extra 15 minutes to give myself a bit of "the fear" to get me out of bed! This is a tip I read in an article on The Pool lately on getting up earlier. The author said the first thing she did when her alarm went off was to put her feet on the floor. From there it's much easier to get out of bed, because you're almost there. I admit I've not quite managed this yet, but I am starting to learn I really haven't missed much on Twitter overnight, and I really could scroll through Facebook on the bus or while drying my hair and save myself some precious morning time. It's a work in progress! It's much, much easier to get up if you have a reason to get up. I never have a problem getting up early on my workout days because I know if I don't haul myself out of bed I'll miss my workout. It's much harder on the days I don't have to get out of bed early. I used to always sleep in on Mondays and Fridays because they are my rest days, but now I love using these days to catch up with my blog, or read, or some days just doing the washing up I didn't want to do last night. For me, my reason is "it's my me-time, get yourself out of bed", but it could be the only time you get to read, or prepare your breakfast, or do your nails, whatver. I admit I don't get up at 6am at the weekends, and I do sometimes need a "reset" early night if I find myself having a late night in the week, but for the most part my 6am starts are part of my weekly routine now. I thought I'd find it hard getting up on Mondays and Fridays when I didn't have to, but knowing I could get a solid hour of doing whatever I want is a huge motivator for me. It's not always easy. I have to kick friends out of my house at 10pm if they come around during the week, and I'm always tired after a midweek cinema trip, but I love my mornings so much it's worth being a little bit tired from time to time! Even when I've had a workout, I give myself 15-20 minutes of me-time, just to read or journal and make a cup of tea, and I always feel ready to face the day much better than when I just roll out of bed! What are you tips for getting up earlier in the morning? Want to start exercising in the morning? Read How to become a morning exerciser.